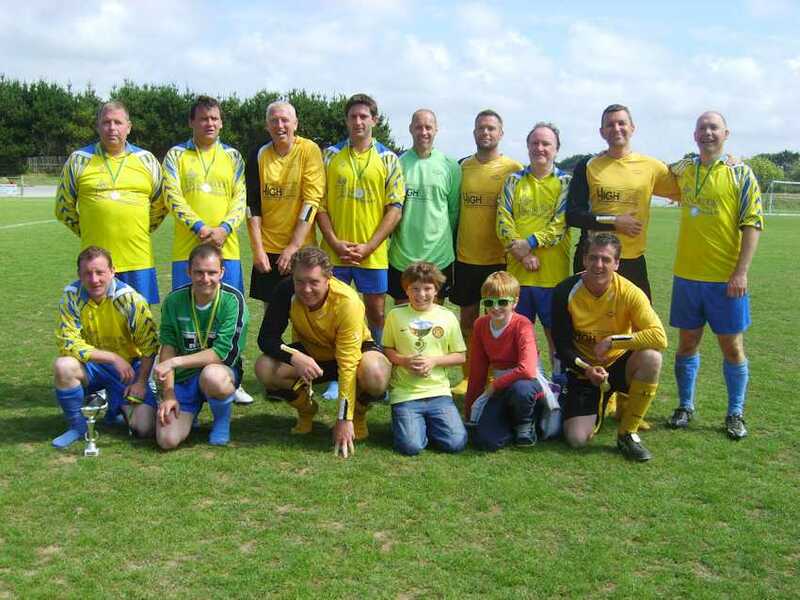 Christmas Bank Holiday Tuesday saw St Agnes AFC host the Tom Benney Testimonial at Enys Parc. 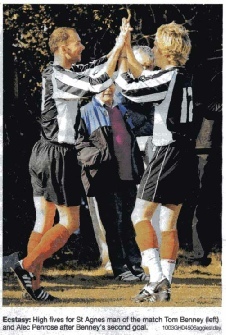 The match was held to mark the early end of Tom Benney's playing career at 29 years owing to a heart condition. The charity fixture between Benney's Boys and Kimmo's Marauders was very well supported with over 30 players intent on playing and marking the occasion. 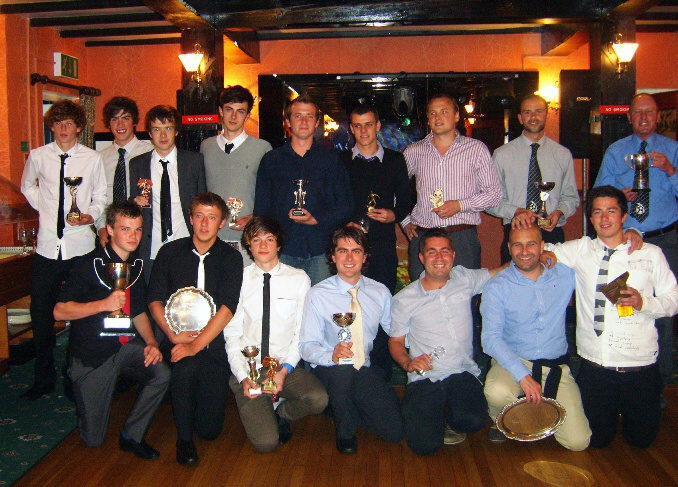 The squads included players old and new with ages ranging from 16-60 years and also contained most of the original St Agnes AFC Combination League Winning side of 2004, which Tom played such a big part in. The match was an entertaining evenly contested affair well officiated by Alan Hoon, Ken Keemer and Paul Minns who had given up their afternoon freely to support the event. The two keepers Paul Luke and Dan Carveth excelled throughout the fixture and Kimmo's Marauders were well marshalled in defence by Scott Jones and Phil Kellow. The best chances for Kimmo's Marauders fell to Justin Andrew, but was well saved by Paul Luke, with Dan Carveth in goal for Kimmo's Marauders thwarting great efforts by Tom Benney and Danny Osborne. Throughout the fixture Tom Benney was well watched by his 'wing man’ dad Clive Benney who had donned boots for the occasion. The winning goal just before half time was scored by Martin Bennett who drilled the ball into the bottom corner past Dan Carveth leaving the final score Benney's Boys 1 Kimmo's Marauders 0. The fixture was very well supported by players and spectators and a collection, raffle and mini-auction raised £650 for the Willow Foundation: a charity founded by ex Arsenal/Scotland keeper Bob Wilson in memory of his daughter which provides special days for seriously ill young adults. St Agnes 1st Team Manager Martyn Kimmins commented, "I would like to thank everyone who supported the Tom Benney Testimonial in every way it was a fitting tribute to Tom for his footballing prowess, his loyalty to St Agnes AFC and to me as a manager." Photo's attached of teams and officials before the fixture and 'managers' Tom Benney and Martyn Kimmins with Tom's dad Clive Benney before the fixture. St Agnes AFC jumped at the chance of supporting the St Agnes Methodist Chapel's Christmas Tree Festival and readily agreed to help decorate one of the 16 trees. 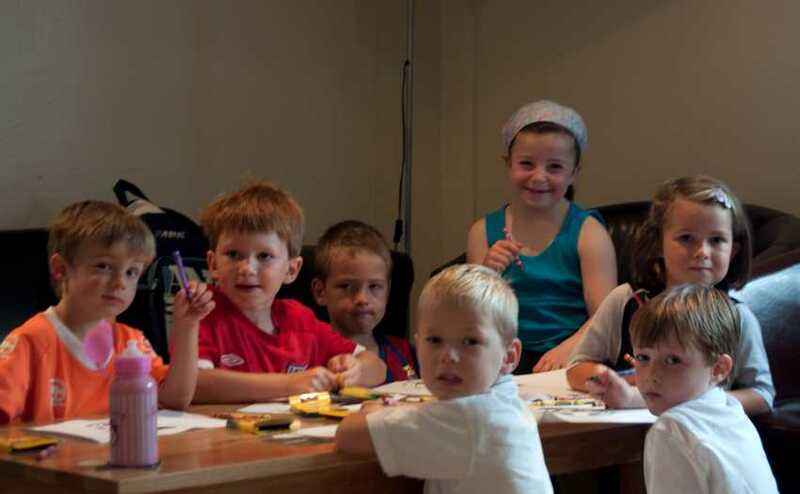 Younger members were asked to colour in a variety of football and Christmas based pictures, which were laminated to form their own very special unique decorations! 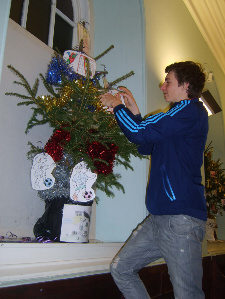 St Agnes AFC player/coach18 year old James Springall then volunteered to decorate the tree in preparation for the Christmas Tree Festival with the Methodist Chapel being open on Saturday 10th and 17th December for people to view the 16 originally decorated trees. James is photographed with the finished St Agnes AFC tree. Club Chairman Mandy Kimmins commented, "St Agnes AFC enter into village life and support our community events whenever we have the opportunity. We decorated a Chapel window in their flower festival earlier in the year and were delighted to be asked back to do a Christmas Tree. I think the younger players did a great job creating the decorations and I would like to thank James for taking on decorating the tree. Some of the other trees at the Christmas Tree Festival are truly stunning and they are all very different in their decorations and originality: well done to the Methodist Chapel for a great event." Members of St Agnes AFC Under 10's and 12's had an action packed penultimate training session on Saturday before their Christmas break when they were all presented with brand new sponsored training jackets. Stephen Potts of Tregease Consultancy (who has sons playing in both teams) is photographed with the boys and manager James Springall. As well as a generous sponsorship from Stephen Potts the club is also very grateful to the St Agnes Publican's who added a further £200 to the total making sure there was enough for all the players from both teams to have a jacket. At the end of the training session the teams were further treated to a feast of Christmas Sausage and Chips complete with crackers, butties and drinks generously donated by Barry and Carol at the Chiverton Arms. St Agnes Chairman Mandy Kimmins said, "I would like to sincerely thank Stephen Potts, the St Agnes Publicans, and Barry and Carol for being so generous and supportive in their sponsorship of the St Agnes AFC Youth teams - particularly in these times of financial austerity! Whilst I am not sure the players are old enough to maybe understand the full impact of the donations given I have no doubt they are thrilled with their jackets and the sausage and chips were a real triumph!" Both St Agnes Under 10's and 12's have league fixtures next weekend before their 3 week Christmas break. The club would be delighted to here from anyone interested in joining St Agnes AFC and a coach/manager or player and full details of the teams and contact details may be found via the club website. Saturday 12th of November at St Agnes AFC Mini-Soccer School saw the Under 8’s host Perranporth in an entertaining fixture with both sides playing some excellent football and enjoying themselves! At the end of the match the children sang a great rendition of Happy Birthday to coach Tom Bartlett and Perranporth player Zack both celebrating that day. Chairman Mandy Kimmins then invited all of the children and parents from both clubs to join St Agnes AFC in supporting National Anti-Bullying week from Monday 14th - Friday 18th of November 2011. Mandy explained, "Bullying can affect anyone and we would like to ask you all to help us put a stop to bullying and create a safer environment for our children to play in." To promote the awareness of Anti-bullying week St Agnes AFC purchased rulers and pencils from the Anti-bullying Partnership Alliance (www.anti-bullyingalliance.org.uk) who represent over 130 organisations working together to stop bullying. Director of St Agnes mini-soccer school Tom Bartlett and coach Ben Pitts handed the pencils out to players from both Perranporth and St Agnes AFC asking their parents to help reinforce the message. Mandy Kimmins said "This morning we have shared the anti-bullying message with more than 100 children and their parents from our Under 12's team down to the 4/5 year old tiddlers group. We have ensured that our club has made the FA's Anti-bullying good practice policy available to all our coaches and available to parents on our club website and hope that this will go someway to protecting the youngsters in our club from bullys and give them the support they need should they find themselves being bullied." When asked how she felt about the St Agnes AFC event to raise awareness of anti-bullying 7 year old Isabelle commented "That was good. It will make us all think about not bullying. I now know if I was bullied at football I would go and speak to one of my coaches and if it was somewhere else I would tell an adult like my teacher or my mum or dad." 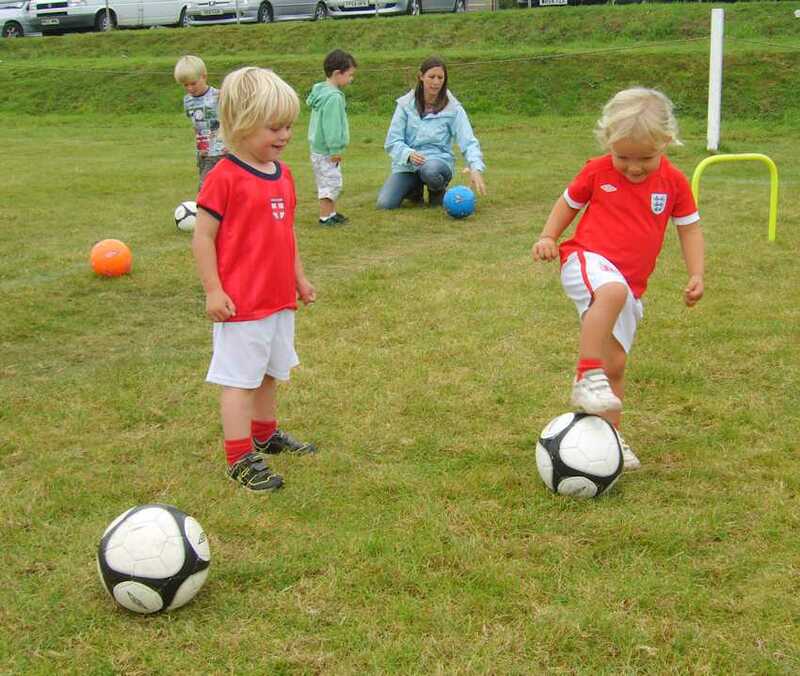 St Agnes AFC mini-soccer meet at St Agnes School from 9.45am -11am on Saturday mornings (except in situations of extreme weather). For more details of the mini-soccer and all the other St Agnes teams please contact Chairman Mandy Kimmins on 07974 370666. 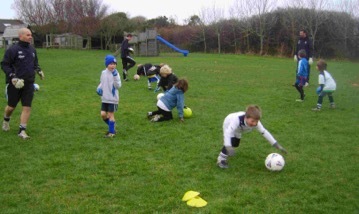 Despite some horrendous weather rain didn't stop play at St Agnes AFC for their half term Tiddler's Football and Soccer Camp. More than 45 boys and girls aged 3-11 attended across the 2 events taking part in a selection of football skills, fitness, agility and all around good fun! 7 year old Morgan from St Agnes is pictured doing a grand job through the agility poles and commented, "This is great fun!" 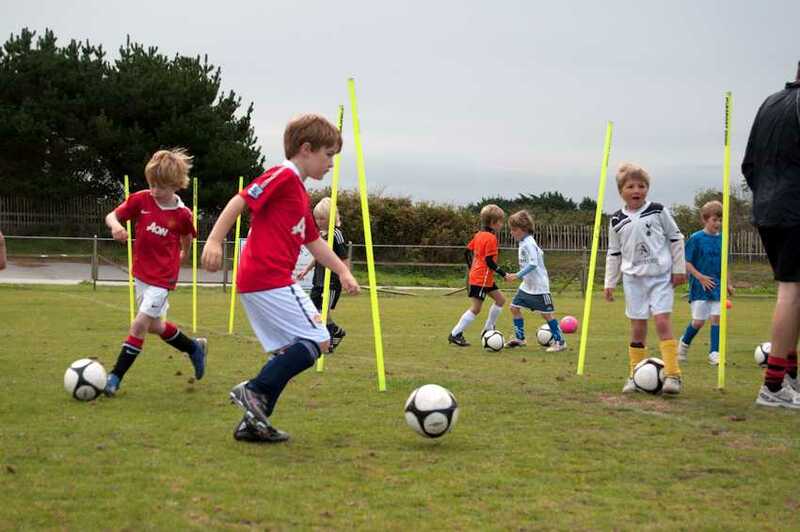 St Agnes AFC Chairman Mandy Kimmins summed the half-term events up saying, "The tiddlers football on Thursday was held in the most awful weather conditions, but those 3 and 4 year olds who came absolutely loved it and the sunshine on Friday for our Soccer Camp was a bonus. The young footballers who joined in were absolutely brilliant and I must say a really big thank you to James Springall, Ben Pitts, and Curtis Pay who gave up their time to help coach and host the events. We raised over £150 for club funds and everyone had a great time!" 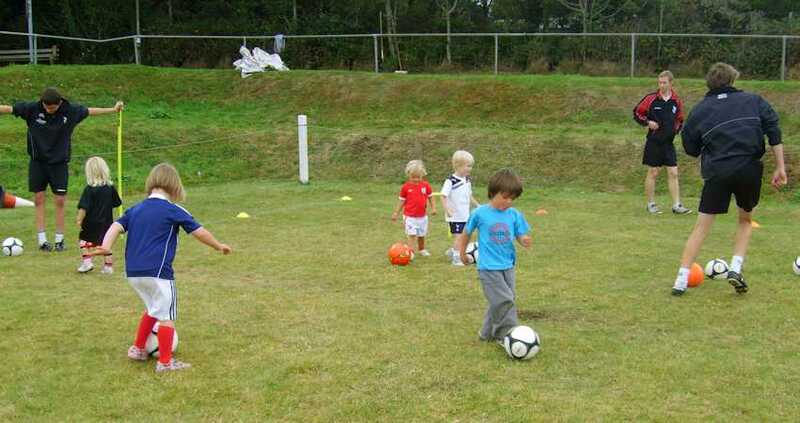 Friday morning saw St Agnes AFC host its first Tiddler's Football session aimed at 3 and 4 year olds. 20 excited boys and girls turned up and took part in games including 'football pirates' and 'tunnels'. The event was organised at the request of one of the local parents who stated, "Thank you for a great morning - we do lots of sporting things with the older children, but it was great to bring the little ones to football this morning”. The event finished with squash and biscuits and a colouring football picture to take home. As I enter my 14th year as manager it’s going to be very strange without Tom Benney. Tom is not able to play any more, under doctors orders, due to a health problem with his heart. Tom has been with me throughout and could have left several times to go to play at a higher level, but he stayed loyal to me and St Agnes Football Club - which is very rare these days! I can only thank Tom for his loyal service, he has been a top striker for many years, a naturally gifted footballer with great balance and and eye for goal. In St Agnes AFC's history of over 100 years he has to go down as one of the best forwards the club has ever had, certainly in my lifetime. When I was younger as a player in the club the top forwards were David Teagle, Paul Euden, David Lang, and Justin Andrew later as I came in to management. As a player I have played with some great forwards including: Phil Shapcock (Falmouth); Mark Rapsey, Graham Nicholls, and Phil Ryder (Newquay); Martin Gritton (Perranwell), and Mark Loram (Torquay). Tom ranks easily alongside them. I hope he decides to stay involved (as well as playing golf!) within the club in helping me or coaching with the youngsters once he has got his head around this far too premature conclusion of his playing career. I would like to thank him for his loyalty, commitment and unstinting support of St Agnes AFC both on and off the pitch (especially for all those lifts home he used to give me and the team on our nights out in Truro). He will be missed on the pitch, especially for his goals!!!! 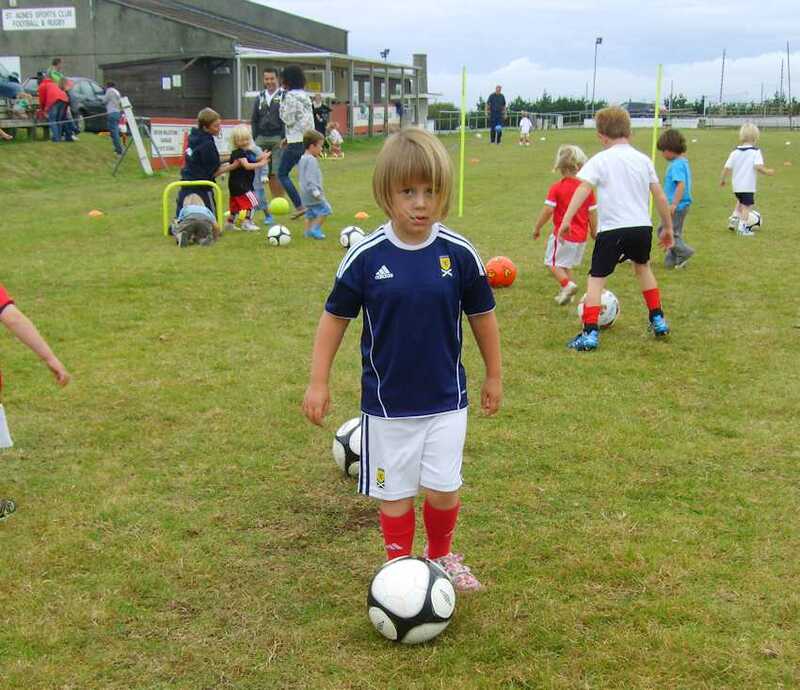 St Agnes AFC hosted their own soccer camp on Thursday 18th August with 40 young footballers turning up! An excellent day with players as young as 5 taking part in football skills, drills, penalty shoot outs and small sided games. The day achieved all its aims of being great value and great fun, whilst also recruiting new players to the club's new Under 8's and 10's teams and also raising important funds towards the future needs of the club's Saturday morning mini-soccer school. 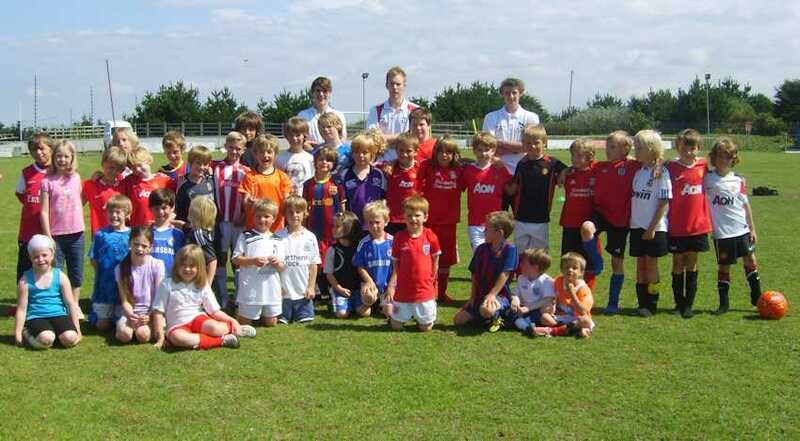 St Agnes AFC Chairman Mandy Kimmins commented "What a super group of future footballers attended our Soccer Camp. I would like to thank everyone who supported it and a special well done to Tom, James, Ben and Lewis who gave up their day freely to provide some excellent coaching!" 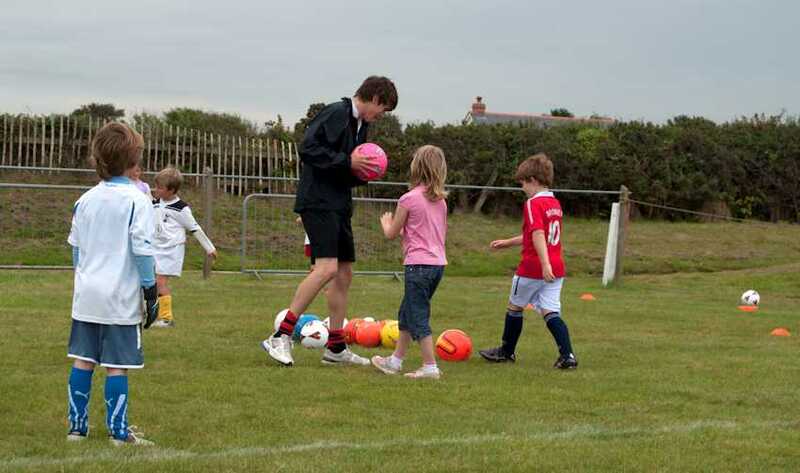 St Agnes AFC Director of mini-soccer Tom Bartlett said "I am really pleased with how today went, the children were brilliant, the weather was kind and we have recruited some new players for our under 8's and 10’s”. During the day children were also asked to design a flag for St Agnes AFC: this competition was won by 9 year old Henry from St Agnes who produced a creative flag, which included football, mine stacks, St Agnes beacon and the St Agnes beach. St Agnes AFC intend to use his design to produce a club flag throughout the season! For more details of the St Agnes AFC Saturday morning Mini-Soccer School and youth teams please call Mandy Kimmins on 07974 370666. 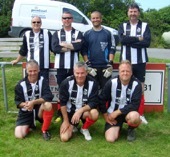 Enys Parc, St Agnes was a hive of activity again this Sunday as St Agnes AFC hosted their 3rd Lady’s 7-a-side Tournament. 27 teams of Ladies had entered from across Cornwall, including two teams from the host club and a touring side Rustall Ladies from Kent. Despite the forecast of horrendous weather, which did put off a few teams from turning up on the day, the tournament kicked off on time playing across 4 mini-soccer pitches with teams competing in the round-robin for places in the Printout Cup or the Supplementary Trophy. The bitter strong wind off the cliffs at Enys Parc didn't prevent some fine football taking place with the St Agnes AFC Ladies Egg Chasers reaching the final of the Supplementary Cup where they faced Bodmin Ladies. 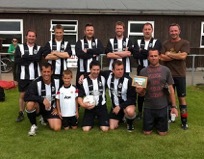 An exciting 0-0 draw led to a close penalties shoot out with Bodmin victorious and the Egg Chasers runners up. 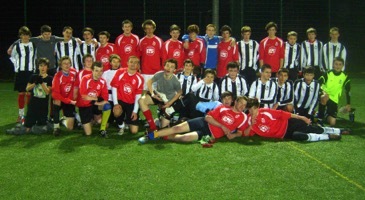 The final of the Printout Cup was an all Newquay affair with Newquay 1 playing Newquay 2. Newquay 1 ended up victorious. The last fixture of the day saw the Winners of Winners Fixture with Bodmin losing to Newquay 1. The Fair Play Award for the tournament voted on by the Referees was awarded to St Agnes Ladies Egg Chasers. St Agnes Chairman Mandy Kimmins said, "Thank you so much to everyone who entered, supported, donated, and took part in every way. A special thanks to our Referees for the day Spencer Hassell, Ben Pitts, Sam Rabey, Anita Gittins, Steve Tootle, Chris Coombes, and Phil Avis who gave their time freely and without whom today events like this tournament couldn't take place." Truro Ladies coach Steve Oliver commented, "On behalf of the Truro ladies we would like to thank you for a great day. Well organised!" The proceeds of the day reached £500 which will be divided equally between St Agnes AFC and Cancer Research UK (St Agnes Branch). St Agnes Ladies are back in training and, having gained promotion this season to Division 1 of the Cornwall Women's Football league, they are looking for Ladies to join their squad as they face a testing season! Anyone interested in supporting St Agnes Ladies as a player or sponsor or in any other way please contact Mandy Kimmins on 07974 370666. 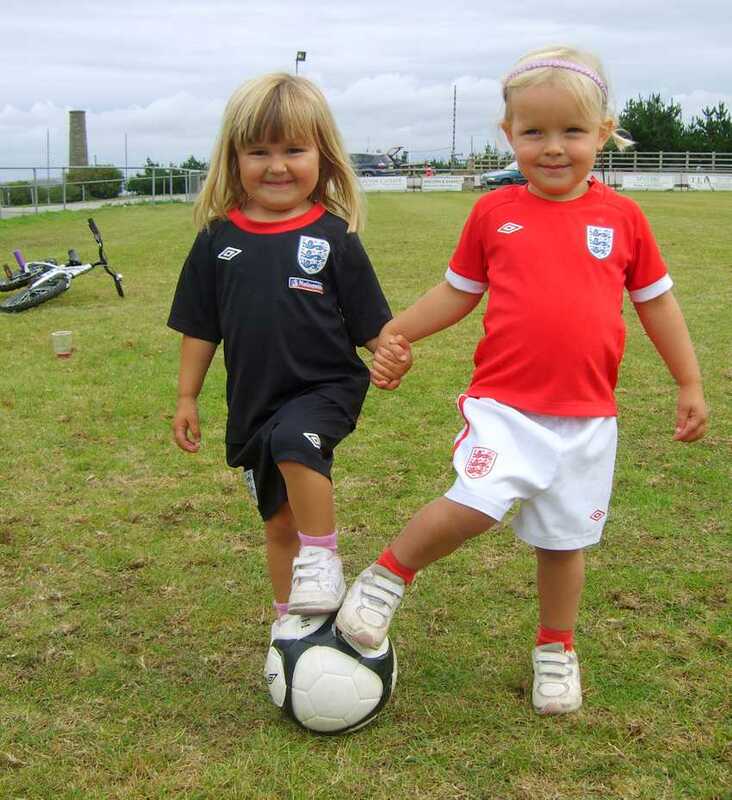 Lady players must be 16 years and over of any ability or experience - join us for some football, fitness and fun! 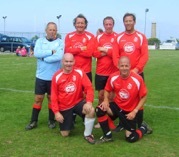 A heavy smell of Deep Heat hung around Enys Parc St Agnes as 10 teams of fine fit Veteran footballers warmed up for the first St Agnes AFC 6-a-side Veterans Tournament on Sunday. The competition took the form of a round-robin across two pitches with fiercely contested fixtures as the Veterans, all aged 35 and over, donned their boots and relived their younger sporting prowess - some for the first time in a very long time! By lunchtime the cheers of of excitement and goalscoring were rapidly being replaced by groans of pain and moans of strain as the fitness levels and competition took its toll. The event was organised by St Agnes Chairman, Mandy Kimmins, and Kate Hawker as a fundraiser for St Agnes AFC and the Lady Gladys Education Centre in Costa Rica: a school set up by Kate Hawker's father John in memory of his mother Gladys Mitchell to provide education for poor children from the area. The last match of the day saw Western Inn A face St Agnes Bolster Mpad in a thrilling final, which ended in a penalty shoot out - Western A lifting the Tournament Winners Trophy. 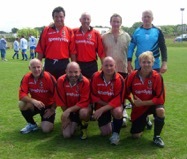 The Fair Play Trophy was awarded to St Agnes Veterans A Team. The proceeds from the event, which included a raffle and mini auction reached £762.50, which will be divided equally between St Agnes AFC and the Lady Gladys Education Centre. Kate Hawker said, "I would like to thank everyone and especially Mandy for this fantastic event and for raising funds to support our school." Mandy Kimmins replied with "What an amazing fun day! Thank you to everyone who played, supported, donated, and helped to raise such a fantastic amount of money. We hope the school will now be able to use this money to help to finish building the football pitch in Costa Rica for the children to play on." St Agnes AFC hosted their end of Season Dinner Dance and Presentations Evening on Saturday at the Rosemundy Hotel in St Agnes. Following a splendid meal the presentations for the three mens teams began. 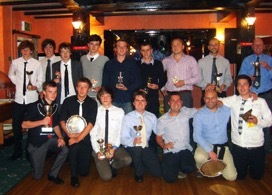 3rd Team manager James Thomas congratulated his team for their halfway finish in the Minining Division 2 and presented awards, which included Alex Walker receiving Players Player; Thadeus Vingoe collected top goal scorer for scoring 30 goals during his time with the 3rd team - he also collected a merit award for his outstanding contribution to the 1st team when he stepped up to play Combination League football towards the end of the season scoring a creditable 17 goals in 18 games! Thads will also be receiving an award from the Mining League as League top goal scorer. 2nd Team manager Dave Keverene and his assistant Mark Hills then congratulated the St Agnes Reserves on finishing runners-up in Falmouth Helston League Division 1 and reaching the West Area Final of the County FA Junior Cup. Amongst the awards presented within the second team were Jack Belche who received Managers Player and Jake Hills top goal scorer. St Agnes Chairman Mandy Kimmins then presented tokens of thanks to supporters and helpers and thanked the Rosemundy Hotel for hosting the presentation evening and providing such a fabulous meal with outstanding service. Colin Butson was then presented with the Chairman's Cup for his outstanding contribution to St Agnes AFC in helping with match day preparations/attending meetings/running the tea hut, and much, much more. 1st Team manager Martyn Kimmins then stepped up to applaud the youngsters within this years first team who had stepped up from the St Agnes AFC youth section to senior football and been such a credit to the club. Receiving managers Player was Bradley Leivers, top goal scorer Tom Benney, and players’ player Jake Shaw. Merit awards were presented to Jordan Maloy, Thads Vingoe, Sam Davis, and Luke Osborne. Supporters player went to Sam Hatfield. The Club Loyalty Award was presented to Paul Luke for his outstanding contribution to the club across the season in playing for which ever team needed him including the Bolster Veterans, helping with goal keeper training, supporting club fundraising, and even helping at the mini soccer school - including the surprise appearance of Father Christmas! 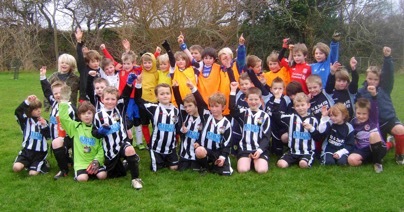 St Agnes AFC Mini-Soccer held their end of season do with a Sports Day. Events included sack races, obstacle races, and piggy back races - all keenly contested! Mums, dads and grandparents all joined in as this seasons coaches Tom Bartlett, Sam Davis, and Thads Vingoe took them through the races to the intense excitement and entertainment of the mini soccer players! 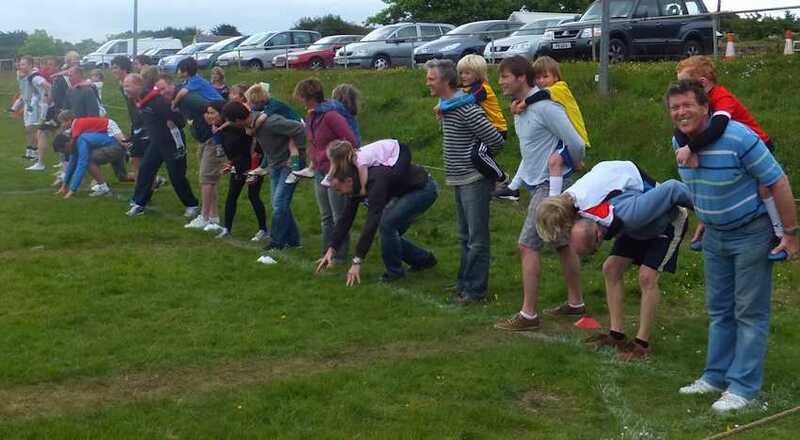 The most keenly contested race was the male only sack race, which coach Thads Vingoe made sure he won although for effort, enthusiasm and technique former St Agnes AFC Chairman (and grandad) David Teagle would certainly have been a contender for a trophy! The sports day activities ended up with a giant football match. The event finished with coffee and cakes during the end of season presentation, with the players all receiving a certificate from their coaches as well as hot dogs and drinks. The three coaches were then all presented with certificates for being 'Super Coaches' throughout the season! Proceeds from the sale of coffee and cakes reached £140 to be shared equally between St Agnes AFC and the Lady Gladys Education Centre in Costa Rica who will use the contribution towards providing sport for the local children. Club Chairman Mandy Kimmins summed the Sports Day up by saying, "What a lovely way to finish the season! The children have all been fantastic and we have been very lucky to have Tom, Sam and Thads in charge!" Sunday saw members of the St Agnes AFC Ladies Team host a charity event in memory of Sylvia Chapman who passed away last year from Cancer. Earlier in the season the Ladies Team had invited Sylvia's family and friends to join them in planting a Bulb Bank at their home ground at Enys Parc as a living memory of her. More than 5000 bulbs were planted by the 200 people who joined in all along the bank opposite the Clubhouse. The bulbs are up and in full bloom and making a fantastic display of Daffodils, a really fitting tribute to Sylvia who was a longstanding supporter, linesperson, committee member, and ladies team member. St Agnes Chairman Mandy Kimmins said, "I know members of Sylvia's family and her friends are thrilled to see the tremendous display that the bulb bank in memory of her has produced. It is completely fitting that a lady with such a joy of life and who was such fun should be remembered by such a beautiful memorial!" 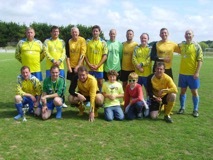 During the ladies friendly fixture against Trevenson a raffle took place raising over £200 for Marie Curie Cancer Care. This is the first of 3 events planned by St Agnes AFC in Sylvia's memory. Photo below by Mandy Kimmins shows St Agnes Ladies wearing this seasons new kit (kindly sponsored by Mill Autoquip) in amongst the flowers planted in memory of Sylvia Chapman. 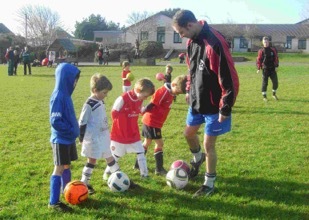 It’s been a busy few weeks at the St Agnes AFC Saturday morning mini-soccer school! Held at St Agnes School from 9.45am to 11.30am, boys and girls aged 5-8 years of all abilities have been enjoying some different coaching experiences including a session specifically on goalkeeping where keepers from within the men's team attended for a morning session and joining in with the kids with some goal keeping activities. Their favourite activity being the catch and shout 'keepers ball' activity, which they all did with resounding volume whether they had caught the ball or not! Another session involved strikers from the clubs men's teams who worked through some exercises guaranteed to improve every new footballers goal scoring capacity. The clubs’ top goal scorer Tom Benney demonstrated how to strike the ball to best effect to an enthralled group of future players. St Agnes also welcomed the Penzance Under 7's and 8's for a friendly fixture, which both clubs thoroughly enjoyed demonstrating some fabulous football all washed down with drinks and biscuits at the end! 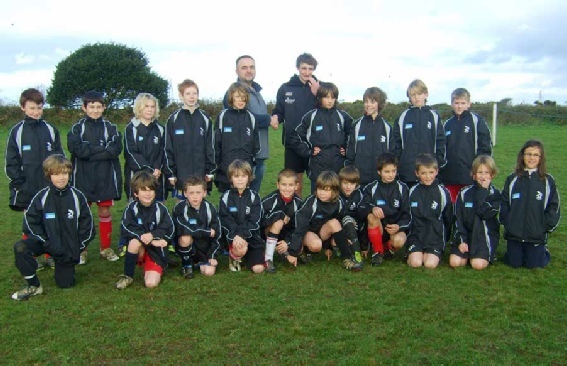 St Agnes AFC hope to develop a new Under 9's team out of their mini-soccer school for the 2011/12 Season and would be delighted to hear from anyone interested in taking up the opportunity of sponsoring this talented group of players! Club Chairman Mandy Kimmins commented, "Our mini-soccer school has been a real asset to our club again and I am really pleased with the way our coaches Sam Davis, Thads Vingoe and Tom Bartlett who are all players within the club have given their time to support the players of the future. 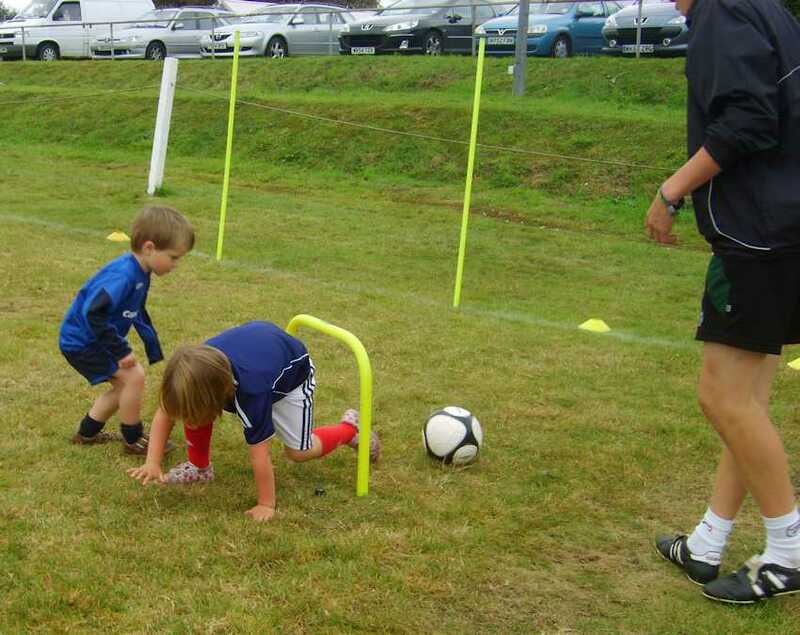 To also have goalkeepers and other players prepared to come along and help as well has been very rewarding to see and the mini-soccer players have absolutely loved it!" First team keeper Ryan Bull and Vets Keeper Paul Luke doing goal keeper activities. Keepers Ben Pitts, Paul Luke and Martyn Kimmins "
Members of St Agnes AFC Under 16's and Under 18's took part in an interclub training fixture to support three of the club’s players who have been selected to represent the Truro College Team on a tour to Japan. Players Luke Osborne, Jake Shaw, and Stuart Hutton who all represent St Agnes AFC at both Under 18's and men's teams had to raise funds themselves to fund the tour. St Agnes AFC Chairman Mandy Kimmins said, "We are very proud of all our club's players and try as a club to support them in any way we can! It is a fantastic opportunity for Luke, Jake, and Stuart and it was very appropriate for the club to support them along their way!" 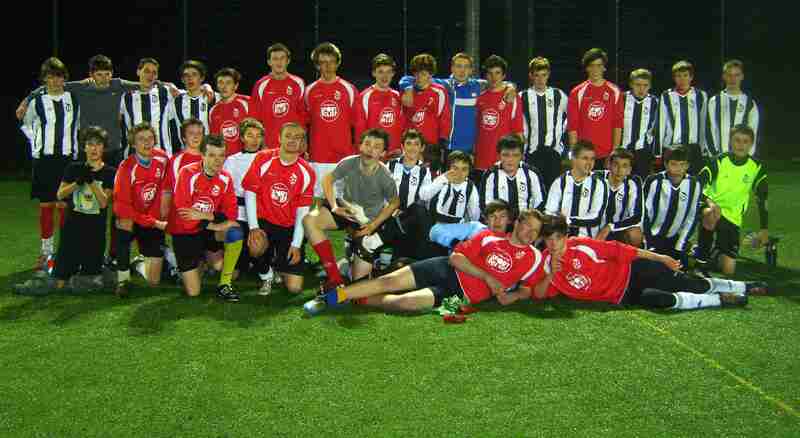 The fixture, which ended in a draw, was played with the boys all wearing odd socks. Their training/match fee from the evening, which amounted to £70, was donated to the college by St Agnes AFC to support the buying of matching socks for the tour.